Several Hollywood movie productions use motion capture to create more realistic movement in CGI (computer generated images) movies. For instance, stunt scenes where the actors are exposed to serious injury if any of the safety precautions fail. Sometimes motion capture is used to have more control over the camera fly-by’s movement in post, such as overview shots of a scene. 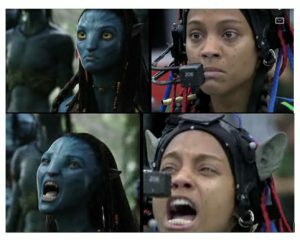 Facial motion capture is also used to record facial expressions with special rigs, as shown above in Avatar, 2009. These are essential for realistic animated characters. Avatar: a special animated movie? pioneered the CGI technology, used this technique because he wanted to create alien figures as realistic as possible. He made sure that several cameras were positioned around a sound stage also combines with equipments present on the actors. One of the key success of Avatar is in fact that they use the Na’vi, the most realistic and intelligent alien society, by having actors simply acting on moves and expressions without applying any sort of makeup or prosthetic. will be released, the great difference with the previous movies, is that these ones will be using motion-capture cameras underwater. Sounds easy right? Well according to Cameron himself it was quite exhausting, as the interface between air and water creates a sort of mirror ruining the images. However it is is totally worth it! Not a part of LabPartners yet? Sign up today to be the first to hear about exciting projects, news and interesting workshops!